It is known that fermented foods are very good for you. 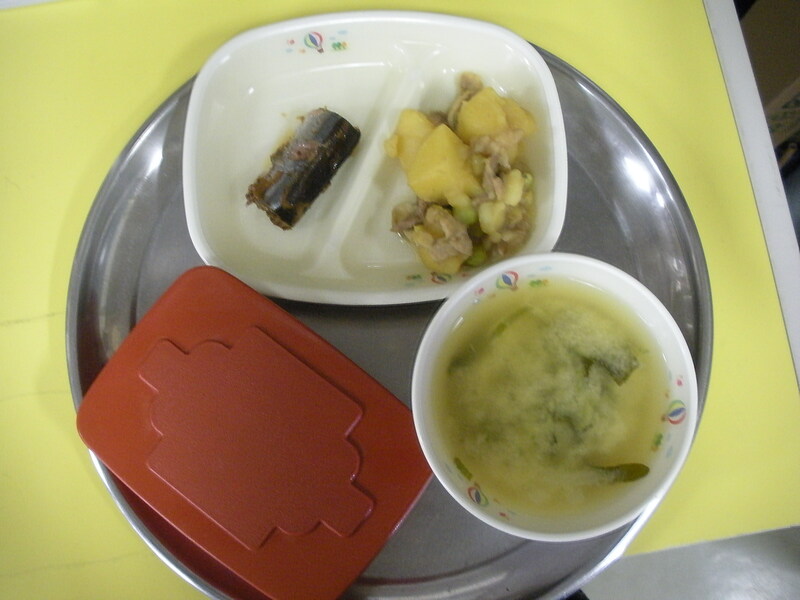 Katsuobushi (bonito flakes) are one of those fermented foods. There are many flavours and seasonings that come from fermented foods, like alcohol and tea. Pickled plums have various benefits such as an antibacterial effect, increasing the appetite, and recovering from fatigue. Today’s saury is finished up by being simmered with it. I am always a fan of Country Soup. It has lots of interestingly textured vegetables, nothing repulsive at all, in a savoury broth that cannot help but make me happy. I liked the egg-bound satsumaage as well. I must confess I am not very fond of saury to start with (it’s bony and dark…), but today’s did have a distinctive pickled plum flavour which was nice. 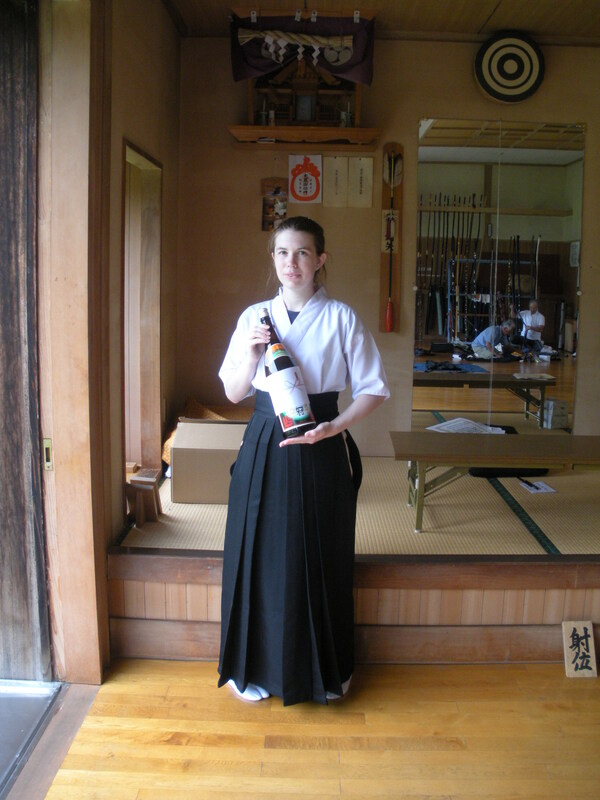 I won this giant bottle of お神酒 at the archery contest for my local shrine’s festival. It’s pretty awesome. 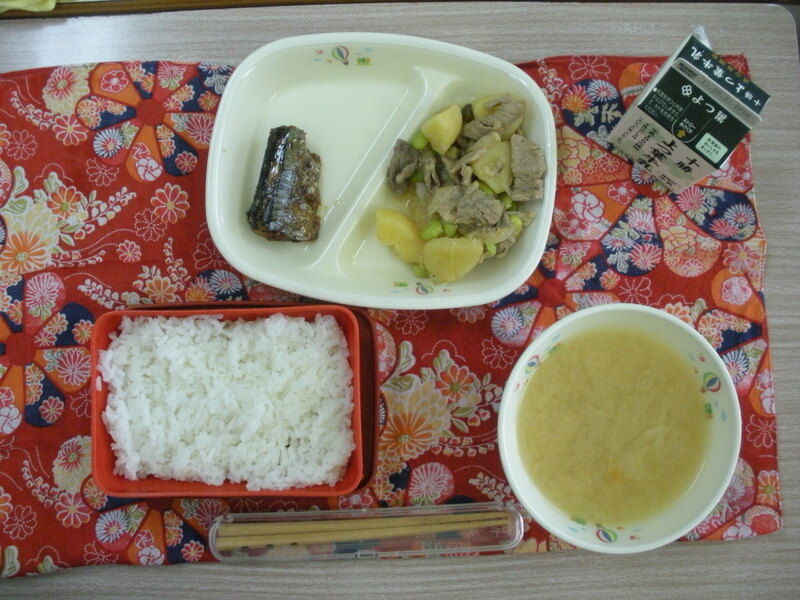 The saury catch increases in Autumn. The saury we use in this season are frozen. It is an easy to use ingredient due to it’s stable price. 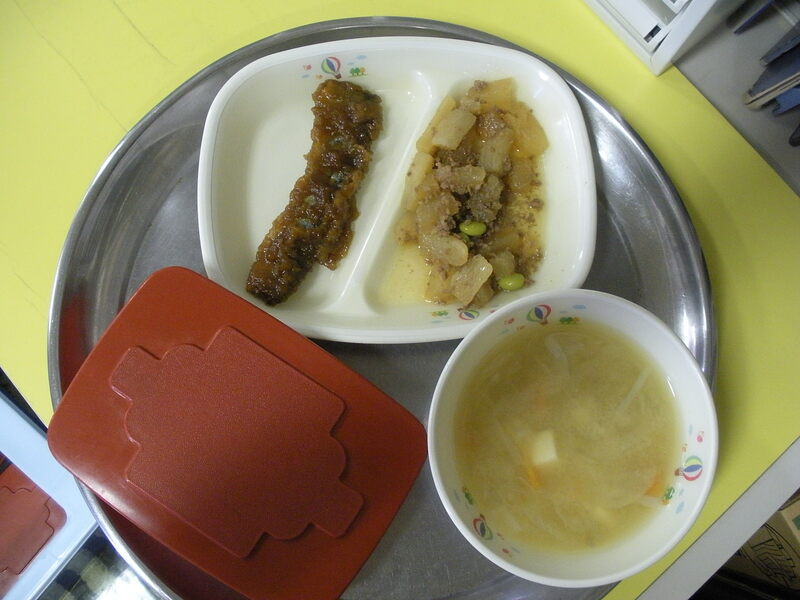 It was cooked kabayaki(eel)-style with a sauce made of shoyu and mirin. I can’t say that the daikon soboro is my favourite. It isn’t bad, but neither is it very good, in my ignorant opinion. 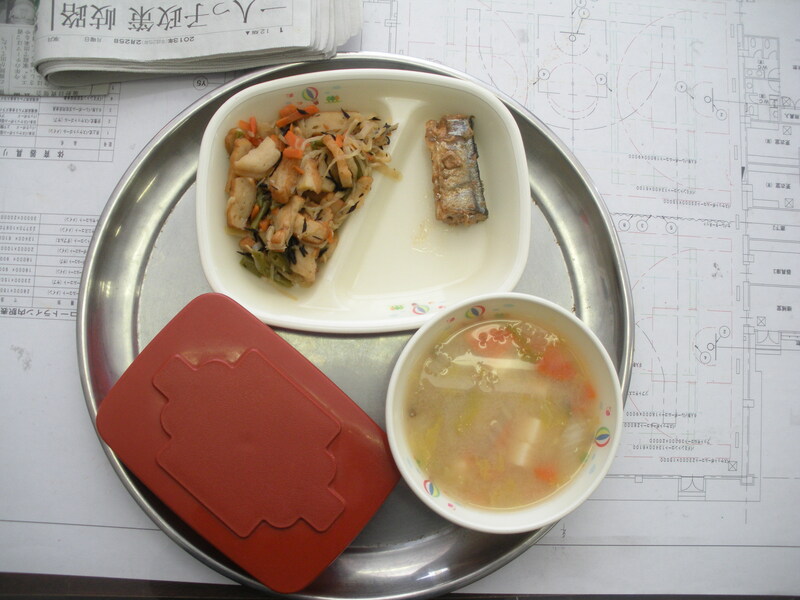 There are fish I like more than saury, but today’s eel-style cooked saury was pretty popular among the boys in my class today. Thus soup (unsurpisingly) was my favorite dish today, although it was strangly onion-y. A year or so ago, one of my teacher’s gave the students some free time–like five or ten minutes–at the end of class. They could work on homework or even talk with their friends, but she said they shouldn’t read in class. This struck me as peculiar. Speaking of historical Japan and reading, Edo period Japan had a higher literacy rate than the Western nations. Thus it is interesting that all the Edo/Meiji period novels I own (which is several), are written largely in kanji all accompanied by furigana. These are popular novels: tales of the supernatural, or tales of love and revenge. Equivalent modern books rarely use furigana and use hiragana rather than the more difficult kanji. I think this is a shame. Not only does a fully glossed text allow the less educated to enjoy reading the book, but it adds a fuller meaning to the text. 握飯 (nigirimeshi) alone only means some rice in a ball. 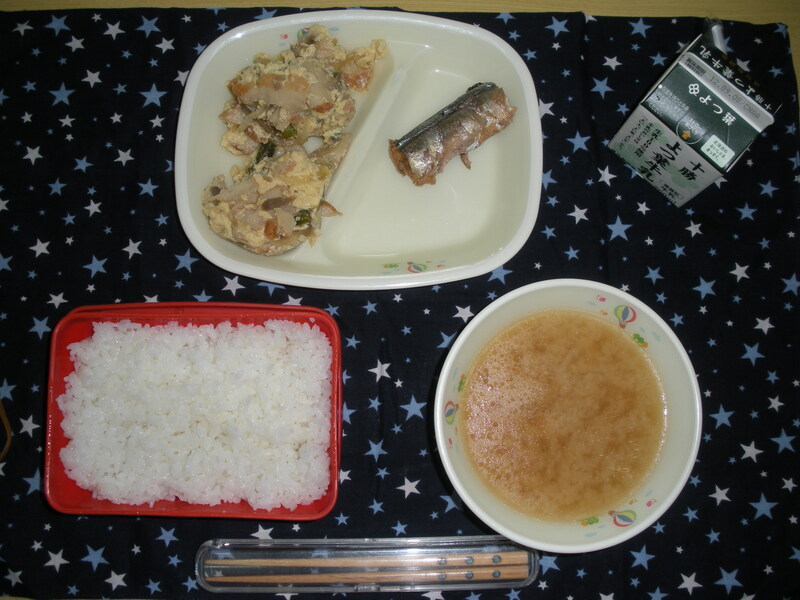 For example, お握飯 glossed as “omusubi” gives it a fuller meaning: more colloquial, slightly soft feeling. And there were many such instances as this. I feel this kanji with furigana glosses method allows the text to be read at two levels: both meaning and phonetically. (If you aren’t convinced, consider how Motowori glossed the Kojiki. Definitely two levels.) It is a shame it is hardly used any more.